It’s that time of year when many of us make resolutions for the upcoming year to help improve some aspect of our lives. 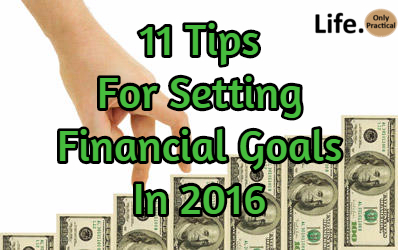 One of the most popular resolutions is our finances. We all want to be more financially secure, but if you are setting financial goals for the next year, you may be unsure where to start. Consider these steps which are designed to help you rein in spending where needed and work toward greater financial security. Set your goals early and share them. Sharing financial goals with friends can help you more clearly define just what those goals are and also hold you accountable. Research on goal-setting suggests that making public statements about goals helps people better commit to them, whether they be goals on money or not. As 2016 kicks off, consider sharing your goals with friends or family who will be able to check on you during the year to keep you on track. Pay down existing debt and don’t take on any more unnecessary debt in the New Year. Not all debt is necessarily bad — debt such as your mortgage, for which you get an appreciating asset, can work in your favor to build your credit and help you get the things you need. But revolving debt such as credit card debt is costly because of typically higher interest rates. Pay off your high-interest credit cards as quickly as possible. Set specific credit goals for yourself (for example, pay off one credit card by April). Enlist the support you need in the form of a credit counselor if necessary. You might also want to look for ways to scale back spending while simultaneously earning more money, which can then be put toward the debt. Life happens and unexpected expenses crop up — your car needs a new transmission, the water heater dies, or you lose your job. It’s vital to have cash on reserve to cover these emergency expenses. Without an emergency fund, you may have no other option when a financial crisis arises than to use credit to pay for the expense thereby increasing your debt. You should have enough cash in your emergency fund to cover at least three months’ worth of expenses, but of course, more is even better. However, if you are starting from scratch or have very little to contribute toward savings, take it one day at a time. 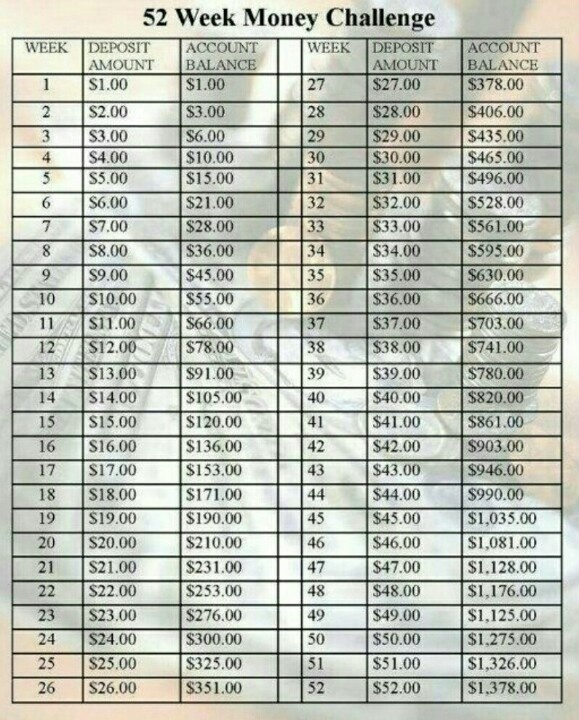 Use the 52 week Money Challenge plan to start and add to it as you can. Or have money taken out of your check each month and deposited directly to your savings. Whatever you do, use a savings account that will accrue some interest to add to your plan and make it inconvenient to get to your money. This will help you save better because it is not easily accessible and will curb impulse buying. As you get older and prepare to retire, it’s important to make sure your money will last. Whether you’re 21 and starting your first job or you’re 59 and approaching retirement, it’s a great time to improve your retirement savings. Maximize the amount you set aside in tax-deferred retirement accounts like an IRA or 401(k). It’s critical to save for retirement, even if you’re young because you won’t be able to work forever. When you retire, having a nice nest egg ensures you can continue to live comfortably when you’re no longer earning an income. That means ensuring your investments are in a portfolio that’s aggressive enough to outpace inflation and reviewing your budget for any big leaks. If you have access to a 401(k) through work, then you can set it up to automatically deduct a certain percentage from your paycheck. Otherwise, you can check on your eligibility for an IRA account. It’s important to use credit wisely and to always be aware of your credit status. Start by taking a look at your credit report from all three major credit reporting agencies. You can get them all for free each year atwww.annualcreditreport.com. Make a habit of checking your credit score and report more than once a year, so that there will be no surprises if you need to apply for credit for any reason. Read up on how to get good credit. Financial literacy is a key factor when it comes to building wealth over time. If people understand basic concepts when it comes to saving, investing, and compound interest, then they are more likely to sit on a significant nest egg as they get older. That’s why it is important to educate yourself now, whether through workplace education programs or online tutorials. No matter how good you are at setting financial goals and achieving them, you can always do better. Make a list of the money topics you’re not sure you know enough about, and then go looking for information. Use the assistance of financial planners and investors to explain what would work best for your specific situation. For example, if you’re not sure how the stock market works or how to invest wisely, take a course on investing or talk with someone in the market. The more financial knowledge gaps you fill, the better you’ll be able to achieve your financial goals. No one likes to think about it, but death is a reality of life. The death of a spouse — and that person’s income — can cause extreme financial hardship for surviving loved ones. If you have anyone in your life who depends on you financially — kids, a spouse, or a dependent parent — you need life insurance to help provide for them if something happens to you. The non-profit organization Life Happens offers a free online life insurance calculator to help you decide exactly how much life insurance you need to purchase. Life insurance is not particularly fun to take out, but it is an essential part of safeguarding your (and your family’s) financial security, especially if you are the primary breadwinner. Remember to review your policies once a year to make sure you have enough coverage. Food might be one constant in our budgets, but there are still ways to trim those costs. Buying in bulk, cooking at home as much as possible and cooking meals that can be stored in the freezer for later are among the smart strategies. By planning meals and keeping perishable items visible at the front of your fridge, you can also help minimize waste. Know how to start over if you need to. If you’ve had a rough 2015 and 2016 is about rebuilding, then you might want to focus on prioritizing savings and re-establishing your credit, especially if it has been destroyed by previous troubles, like filing for bankruptcy. Financial experts suggest going slow, making on-time monthly payments, to eventually reach a higher credit score. Take advantage of deals and freebies. You might be surrounded by free items in your area and not even realize it: Local museums, libraries, public parks, and outdoor concerts are often all around, but you may be overlooking them. Taking advantage of those freebies can help cut your entertainment costs while allowing you to go out more. Call places that are not free for deals and coupons as well. Many local attractions will have discounts at certain times of the month or year, or even a specific day of the week. As important as it is to save money, it’s also important to spend it in ways that bring you joy before it’s too late. That’s why many financial advisors recommend traveling in retirement before health issues make it too challenging and spending as much time with family members as possible.